Br. Roberto Méndez López, from the Marist University of Querétaro, Mexico, as President; Br. Clemente Ivo Juliatto, from the PUCPR Curitiba, Brazil; David Hall, from the Catholic University of Australia, in Sydney; and Br. Pablo González Franco, from the University Champagnat of Lima, Peru. Since 2004, with the first meeting at Curitiba, theMarist International Network of Institutions of Higher Education has been going its way. It was during the preparations for the next meeting, the fifth, to be held at the Marist University of Mexico in October 2012, that the new logo of the network was launched. Le success of a project, independently of its objective, requires the creation of an attractive icon. 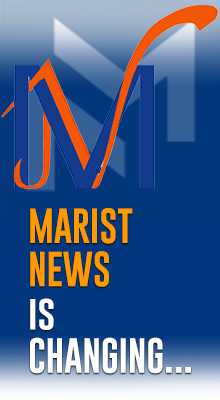 The logo occupies an essential place for achieving this ideal; it could not be otherwise when it is a matter of reinforcing the Marist Mission in the Institutions of Higher Education. 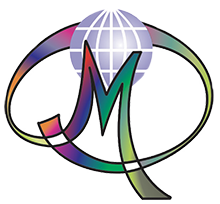 All through the process of creating the logo, attention was centred on Marist principles. Each element in the label contains a proper value and together they form a graphic representation of a mission for the whole world. « Union » has been the element of priority for the realization of the Marist label. The five pillars leaning towards the centre of the heart translate this union. The heart, stylized with the help of soft traits, presents a modern aspect, but at the same time symbolic: it represents the Marist presence. It will be noted that the extremes do not join, the heart remains always open; a simple yet expressive detail. 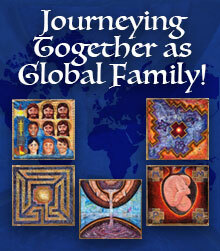 The words « Marist International Network » are put in relief beside the graphic part. Placed on the right, they are easy to read and play an important role in the title. In the lower space, the text « Institution of Higher Education », in reduced dimensions, offers a homogenous and interesting composition. The use of two colours completes and consolidates the logo: blue, which transmits tranquillity and control, shares the space with red, a colour expressive and ‘active’. The graphic creation and edition were realized by Diego J. Teide and Glayce Pasetti, under the direction of Andrew L. de Queiroz.